The footage of men, women, and children in paroxysms of agony in the wake of a chemical weapons attack near the town of Khan Shaykhun in Idlib province, should make even the most hardened among us to weep. Such human suffering obliges us to question the very premise upon which we like to consider our world as advanced or civilized. And it is precisely because of this that when we are witness to such an ontological breakdown in humanity that we must resist the pressure to accept the officially prescribed narrative of responsibility at face value. When it comes to this particular attack, just consider for a moment the timing. It arrived immediately after the Trump administration confirmed that regime change was off the table where Syria was concerned, stating that its priority was fighting Daesh. It arrived in advance of an international donor conference concerning Syria in Brussels, organized by the EU. Then we have the fact that on the ground pro-government forces are winning the conflict, with all opposition forces in the northwest of the country forced into Idlib province after the liberation of Aleppo back in December 2016. In other words, for pro-government forces to carry out such an attack at this time would constitute an act of political and diplomatic self-harm of near-historic proportions. 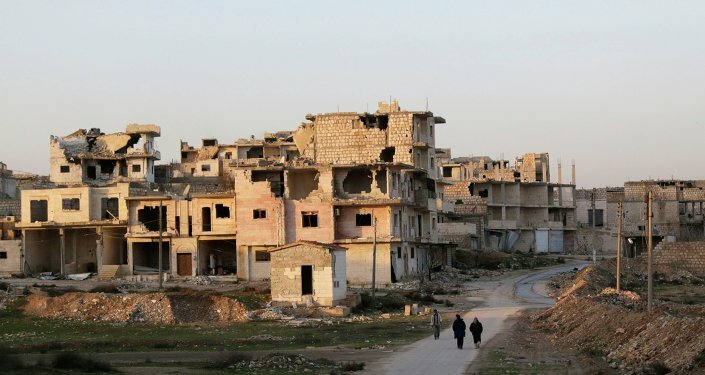 There is also the fact that the assertions carried widely in the Western media, blaming pro-government forces for the attack, have emanated from openly and avowedly pro-opposition sources within Idlib. This is because no Western journalist or news crew would dare set foot there, or indeed in any part of opposition-controlled Syria, knowing that as soon as they did they would be kidnapped and butchered. The Syrian government did not deny that it carried an airstrike in Idlib around the same time footage emerged of such unconscionable human suffering. Their explanation is that they bombed a weapons depot close to the town in which Salafi-jihadi groups were storing chemical weapons. Confirmation that such groups are in possession of chemical weapons came in 2013 from UN special investigator Carla del Ponte, based on a UN investigation carried out concerning previous allegations of their use. This, of course, is not the first time that pro-government forces have been accused of launching a chemical weapons attack during the conflict in Syria. In August 2013, it was claimed that the Syrian Army fired artillery shells containing the nerve agent sarin against civilians in the then pro-opposition district of eastern Ghouta on the outskirts of Damascus. The fallout on that occasion almost led to US and Western military intervention against the government — intervention called off at the very moment the ships and aircraft were ready to be unleashed by the Obama administration. In the wake of what would have been a disastrous turn of events, should said intervention have gone ahead, Russia succeeded in brokering a deal with the Syrian government that saw its entire stock of chemical weapons destroyed. This was undertaken and completed in 2014 under the supervision of the Organization for the Prohibition of Chemical Weapons (OPCW). The UN investigation into the attack on eastern Ghouta did not establish the provenance of the weapons, or who used them, regardless of the howl of condemnation of the government that ensued in the West. However various dissenting voices were raised challenging the allegations, though likewise they also found themselves demonized. Among those dissenting voices was the veteran US investigative reporter, Seymour Hersh. "In the months before the attack [on eastern Ghouta], the American intelligence agencies produced a series of highly classified reports, culminating in a formal Operations Order — a planning document that precedes a ground invasion — citing evidence that the al-Nusra Front, a jihadi group affiliated with al-Qaida, had mastered the mechanics of creating sarin and was capable of manufacturing it in quantity. When the attack occurred al-Nusra should have been a suspect, but the administration cherry-picked intelligence to justify a strike against Assad." It is worth repeating: the fact that a negotiated settlement to a conflict of such unremitting suffering over six long years remains elusive is an indictment. However the idea that regime change can be seriously considered part of any settlement is also an indictment. The days of destroying countries in order to save them are over; and rightly so given the damning evidence available of the domino effect this particular exercise in folly has produced. Afghanistan, Iraq, Libya… haven't these people done enough damage?